Stafford Film Theatre is a local organisation dedicated to showing many of the best films in British and World cinema in the county town. Around half our presentations are sub-titled foreign language films. We believe in showing as wide a range of features as possible and our programmes encompass internationally acclaimed masterpieces, off-beat comedies and contemporary thrillers, amongst others. The Film Theatre is manned entirely by volunteers who choose, order and publicise the films and help organise the presentations. Moreover, members are asked to contribute to the selection of the programme for each season. 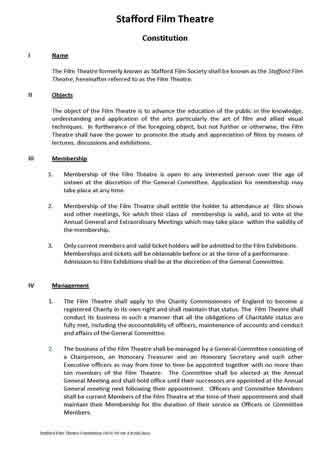 Following our move to The Stafford Cinema during the Spring and Autumn seasons of 2014, we are now firmly re-established in the Stafford Gatehouse Theatre. Digital projection and sound equipment allows us to screen the films we really want to show. We are grateful to Stafford Gatehouse Theatre and Stafford Borough Council for making this possible through their timely investment. During the season our doors open at 7:00pm and the programme commences at 7.30pm on most Tuesdays. We are open to all members of the public (age restrictions applying). While membership is not necessary our members do enjoy considerable savings on the price of each film (down to about £5.00 - 30% - a film currently). Any surpluses made are ploughed straight back into showing more films. Please click on the the image above to open the document in Adobe PDF Reader.